Holy Moses! : Kathie Hill Music, LLC, Making music with and for kids for over 25 years! Home :: All Kid's Musicals A-Z :: Holy Moses! Join the cast of "Trading Places" at a Hebrew home and an Egyptian palace where Page Turner, Hildi Vine, Frank Incense and Ty Kwando assist kids in discovering the story of Moses. But there's no redesigning history in this musical as kids learn about the plagues, the Passover, the Exodus and the Ten Commandments through clever lyrics and memorable music. As in his own life, the emphasis of this musical isn't on Moses, but the God of Moses — the Great I AM! Set: present day Egypt on location with "Trading Places"
I have done at least 7 Kathie Hill musicals and each has been a wonderful experience! This year we did Holy Moses! With only have 22 kids in our children's choirs ages 4-11 we used some staff members and parents for the "adult" parts - but the kids knew all the words to each song and the choreography! What a joy to see kids learn the Bible in such a fun way. 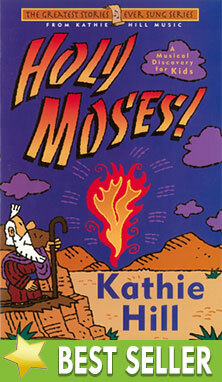 They can say the Ten Commandments and Ten Plagues thanks to Kathie's witty songs! I highly recommend using this for whatever size choir you have. I teach elementary music and chorus at a Christian school with 1000 students. Each spring we present a musical. Six years ago we performed Holy Moses! Thank you, Kathie Hill for musicals that are Biblically sound, musically interesting, and dramatically clever! Accompaniment CD - Holy Moses! Director's Aide Pages - Holy Moses! Previously owned books with songs, script, production notes, piano transcription - pristine but for blank front label - limited supply. Choral books with songs, script, production notes, piano transcription - pristine but title page blank label. Instructional/Movement DVD - Holy Moses! Downloadable orchestrations for 7 songs (5 brass & 2 violin).